Here is a collection of information that might be valuable to members of Toastmasters International who are Vice President of Public Relations(VPPR) for their clubs. Handbook for VPPR Training. This contains the outline from which this training session originates. Brand Portal. This link contains downloads for logos and graphics for fliers, business cards, letterhead, newsletter templates and any material that you might use to promote your club. Scroll down to Create Your Club or District Website to learn more about setting up the website. PR Handout This is a list of links that tell you everything about VPPR. It covers much, much more than you ever need. A one stop link list. Mondo Times. Interesting external link that helps you find media outlets to which you might send information to publicize your events. Google Toastmasters VPPR. These are the result of the google search. There is a lot of information out there. Club Training Materials. This page contains the guides and powerpoints from which I build this presentation. Use of Web Pages. Toastmasters starting page for building a website. Brand Portal. Scroll down to Create Your Club or District Website to learn more about setting up the website. Toastmastersclubs.org. This is the starting point to build your club website. 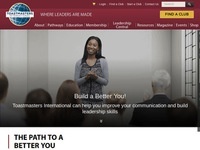 Toastmasters Website Wiki. Here is a compendium of links to club and district websites, the good, the bad and the bland. Creativity is plagiarism from multiple sources. WordPress.com. Visit here to build a Club website hosted by WordPress. WordPress.org. This is the site to visit if you are hosting your site through a website host on your own.